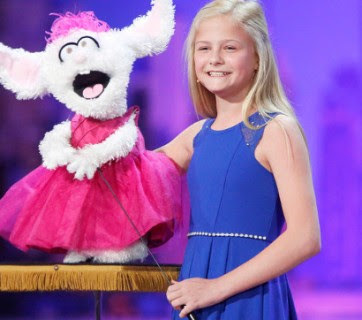 Multi-talented 12 year old Darci Lynne, a singing ventriloquist act, won the 2017 America's Got Talent Competition on Wednesday night September 20th, claiming the $1,000,000 prize and the headlining of a show in Las Vegas. She's so talented, that every single time she performed, the audience and judges gave her a standing ovation. She beat off competition and looked as though she’d secured the win after her stunning final performance. The first part of the final, which aired in the US on Tuesday night, saw her joined on stage by puppets Oscar and Petunia. And after launching into a hilarious routine in which Oscar failed to realize he was live onstage, it didn’t take long before Darci Lynne had the pair bickering over who got to sing in a duet. It led to another cheeky quip at the judges’ expense as she pointed out: ‘Guys…you shouldn’t fight. ‘You need to work together,’ Darci Lynne added. ‘Like some of the famous duos, like Laurel and Hardy, Hall and Oates….’ ‘…Simon and Mel B?’ chipped in Petunia – as her owner reluctantly added: ‘Well, at least two out of those three are good examples.’ Cheeky! 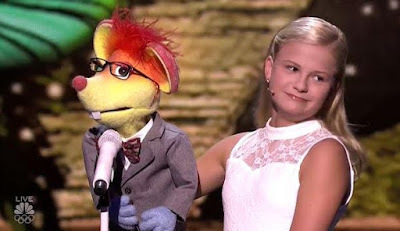 Suffice to say the puppet pair settled their differences and duetted on a performance of With A Little Help From My Friends – with a little help from Darci Lynne, obviously.